We are reviewing little old but still excellent performing gaming laptop Asus ROG GL552JX. We bought this review for Asus ROG series fans who are still looking for best device for their gaming at competitively less cost. 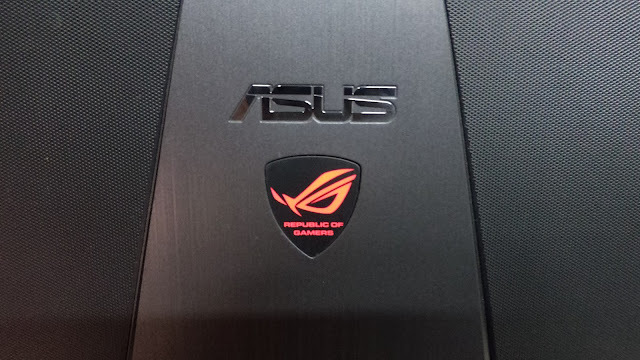 As we all know ROG series of Asus are specially design for gamers. Where Asus ROG GL552 has been design for gamers. But there are thies who cannot afford their high end devices like Asus ROG 751. This is the box we have received from Asus. 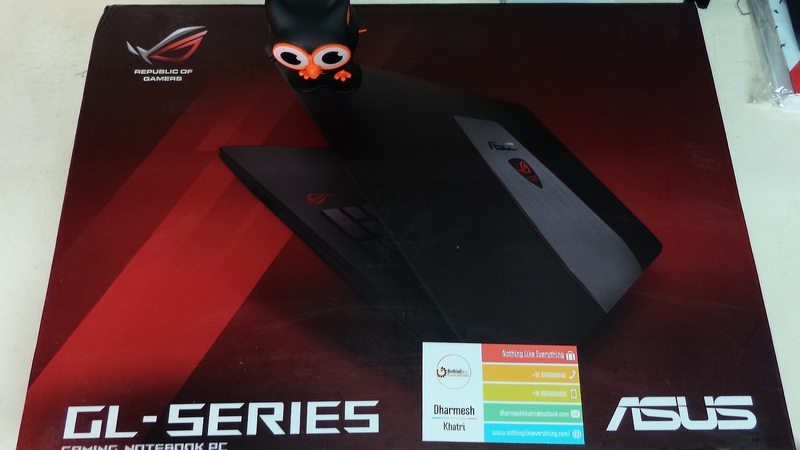 From outer appearance box was of good quality including, Asus ROG GL552 comes in two variants one that comes with metal body and another with plastic built body. We have got plastic body device which seems ok and have poor build quality. At the end we will conclude the verdict about this faming beast.Let's begin with Review. Asus ROG GL552 is very portable with weight of 2.57 Kg allow you to take it anywhere you want. This laptop is fairly compact since plastic durable material is used for making of this laptop, hence reduce the weight to the good extent. As per screen flap design is classic with Lid Log of Asus ROG in the middle as you can see below image. Even material used is not that impressive but design look very decent and premium. Well talking about screen of the device colors are vivid and well saturated. There is also VGA camera on the top of the screen for video chatting and recoding. But screen lid is week and flexible. If you have habit to put anything on laptop while it's flap is close then change that habit. You need to be extra careful that laptop do not get much pressure from flap or screen side or it may prove fatal. Even need to be extra careful while taking it with back pack. Beside while carrying it in hand grab it from middle not from edges. As we talk about keyboard part the material is durable and not flexible. It can take much pressure and solid to use. Design is also elegant. Look and feel is also very solid while using it. Check the image below. If we start from top we can see below th Asus Logo on screen bad Republic Of Gamers written in Red latters. Below that we have large speakers that produce Excellent sound but it depends again on your setting. But sometimes treble is more in sound produce. Below speakers there is keyboard comprises of standard keyboard and numeric keypad. As usual we have red lid keyboard which assist for working in dark environment. But as this is specially for gamers WASD keys have been specially emphasized. The trackpad is cool enough to work with and much sensitive for touches. But it much more smoother for working with two finger touch scrolling like increasing volume in VLC will take wother sound to 200% or down to 0. Beside performing some activity where you need to do right and left click simultaneously or together there is no way you can do it. So I'll suggest you can use mouse on alternative way for it. As we can see in above image this side of laptop contain (from left to right) first comes the charging port followed by air-vent from where heat is thrown out to keep processor and device cool. One thing I like about Intel processor they are powerful as well as they perform their job silently. Unlike AMD they does not make much noise. Followed by air vent there VGA poet that are used to connect OLD monitor or projectors for presentation purpose. Moving further we have HDMI port that allow advance connectivity with other devices and much faster in performance. So you can have backward compatibility with almost all devices. Moving further there is LAN port for connecting wired Internet to your device. At the last it have 2 USB 3.0 at the end. On the other side of the device moving left to right we have 2 audio ports for attaching headphones or home threater or woofer system to you Asus ROG GL552. Moving further we have USB 2.0 port which cna be used for data transfer connecting mouse and much more. at last we have DVD reader and writer for back up your data or transferring data from DVD to your Asus ROG GL552. 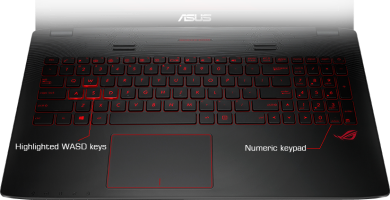 Asus ROG GL552 also have card reader and light indicator which shows status of Wi-Fi, CAPS lock on or off and NUM lock. Above configuration seems awesome isn't it ? The core i7 really performance it's job silently and effectively. Here are out hardware and other components of Asus ROG GL552 components and their comparison with other components in the market. We have tried playing following games and all works well on this year old Asus gaming laptop. All of the game stated above was working like a charm. Device was not getting that much hot. Most intense gaming of Batman Arkham Knight and The Witcher 3 which eat lot more resources, sometime result into lag and make device little worm. The highest temperature we have reported is 40-44 degree. But as far as game execution is concern device working like charm. i7 + NVIDIA GTX 950M perfrom their job much battery way then expected. Asus ROG GL552 have all high and excellent quality hardware which can perform heavy task very efficiently. You will get charging adapter with Gaming mouse along with Laptop bag-pack from Asus. Note : Online price subject to change as per company policy and market demand. Just keeping aside little compromise on build side. Performance and quality of performance of Asus ROG GL552 is very excellent. As compared to other device in the same class all other devices are price above 80000 and above. this device is even compatible with more resources demanding games. Perform all heavy task efficiently. I will say it is best buy for you. If you have nay query or any question do let us know in comment section below. Thank you for reading. Stay tuned for more.